Welcoming common areas, lounges, kitchens, and casual meeting spaces abound in Condé Nast Entertainment‘s new office, designed by TPG Architecture. 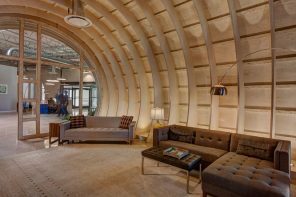 Here, TPG designed a multi-seating collaboration area that incorporates soft seating with more traditional café meeting spaces and raw, exposed materials for an industrial aesthetic. Photo by Eric Laignel Photography. Condé Nast Entertainment is one of Condé Nast‘s fastest-growing divisions, encompassing 17 digital video channels for the company’s titles (like Vogue, WIRED, and Bon Appétit). The office also includes Condé’s Technology Group, which creates apps, websites, and handles other product development, as well as the complete company archive that dates back more than 100 years. For the new CNÉ office, TPG Architecture designed spaces that include not only desks, but also many other areas for work and informal gatherings: welcoming common zones with couches and upholstered chairs, lounges, kitchens, casual meeting spaces, and a variety of conference rooms. Vibe-wise, CNÉ said they wanted something that felt like a “San Francisco loft” with a rustic, industrial look. 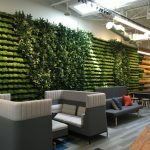 That inspo in mind, TPG also worked with them to create a feeling of fluidity, mobility, and flexibility, in large part because much of the workspace caters to not only the full time staff (most of whom work from a laptop), but also to a large cadre of freelancers and other consultants. We reached out to Suzette Subance, design director at TPG, and Samantha McCormack, a project designer, to find out more. There’s immediate brand recognition through signage in elevator lobby and digital screen, visible on arrival. Photo by Eric Laignel Photography. Photo by Eric Laignel Photography. How many total employees are there and what is the daily population? Designers made a visual connection to 1 WTC via a feature seating area. Photo by Eric Laignel Photography. Is there a mobile work or work-from-home policy or are most of the employees there all day, every day? Most employees work in the office all day, every day. However staff are encouraged to work from places other than their assigned desk. Is any part of the space unassigned? If so, how much? The collaborative, team spaces are all unassigned; however, all stationary workstations are assigned on a one-one ratio, staff to desk. One of the more unique living room set up meeting areas where all details, from the furniture selection to the chalkboard rail to the animal head were critical to creating the unique and eclectic feel for the entire space. Photo by Eric Laignel photography. Tell us about the office’s proximity to public transportation and other amenities. The office is located in downtown Manhattan, across the street from the new Fulton Street Transit Station. It is also in close proximity to the WTC Transit Hub and One World Trade Center, where the Condé Nast magazine publications are located. It was critical for the staff of these two offices to be located in close proximity to one another. In the CNÉ space, there is a feature lounge focused on the view of One World Trade Center to help emphasize this connection. CNÉ worked with Lane Office Furniture and utilized Knoll Antenna workstations, however, the use of standard contract furniture ended there. The client strongly desired to have a more casual, collaborative office space, not one that looked like a corporate office. Lounge pieces were sourced from West Elm, Restoration Hardware, and small, local furniture stores such as A&G Merch, located in Williamsburg, Brooklyn. The conference tables were customized oak wood top tables with plumbing pipe fitting legs to match the overall design sense and function for the management of interior wiring. The credenzas in these rooms were sourced from a small manufacturer that created door fronts from recycled car metal. Dense, open workspace, an exposed ceiling to satisfy the desired industrial aesthetic, and non-traditional workplace lighting. Photo by Eric Laignel Photography. The company’s brand is reflected in the space through the overall design aesthetic which was more of a raw, industrial, loft-like startup style including numerous technology enabled meeting spaces. Since CNÉ is focused on creating digital content, all meeting spaces (formal, informal, open or closed) needed to have TVs where network content could be easily and readily accessed. The client wanted to make sure that there work was always on display. There is not one unique feature. 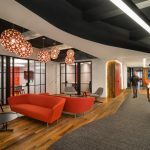 The whole project was unique in that it spread across three floors, each floor looking and feeling like its own flavor, creating alternate meeting spaces and a vibrant environment that staff is excited to come to work in every day. This space is reflective of a hospitality environment that is commonplace in the workplace today. An example of the variety of collaboration spaces across the office. Photo by Eric Laignel Photography. The staff of CNÉ were excited to leave their old space in midtown. This office is their first real home – previously occupied office space had been inherited from a corporate bank sublet. The old space was the opposite of the design concepts important to CNÉ; it had no access to natural daylight (all windows were blocked by perimeter offices), and had oversized, isolating cubicles and no collaborative spaces. Small retrofits had been made to the space in the year that CNÉ occupied it before moving into 222 Broadway, but the staff was happy to have a permanent home built to their work style. The “functional” game area which includes a TV and chalkboard for ideating, in addition to playing. Photo by Eric Laignel Photography. Although no formal post-occupancy surveys were completed, on follow-up visits to the site it was thrilling to see all the various collaboration spaces being used as intended and feeling the overall buzz in the office space. Staff were utilizing work counters with their laptops, playing ping pong, covering the writable walls (both marker board and chalkboard) with thoughts and ideas, and making use of all the integrated technology.